In December I wrote about Alan’s great suggestion of placing a landing pad at the bottom of his stairs. The more I thought about it, the more I realized that it could really help Ellie. Ellie usually has trouble transitioning from our last carpeted step to the hardwood floor. This has resulted in some tumbles and accidents — some more serious than others. That thought of the landing pad stuck with me, and at one point when Matt and I were out at a home store, we decided to buy one. We definitely went through our needs, or rather Elle’s needs, before placing one in our cart. Need: Something that won’t go sliding once she puts her weight on it. Answer: We found several kitchen mats that had a grippy back. Be careful though, as some grips are better than others. Need: Something that her nails wouldn’t catch on. Answer: There are a few cute woven or braided rugs out there, but I was afraid she’d catch a nail and make things worse. We were able to find one with a microfiber fabric that is easy on her nails and has held up rather well (so far!). Need: Something with a little padding to it, just in case she falls on top of it. Answer: There are a number of kitchen mats out there that are a little thicker or made with memory foam. While the original intent was to keep us a little more comfortable while doing the dishes, it also works perfectly for a tumbling kitten! Need: A mat that’s the right size for her. Answer: I watched her carefully to see how she would come down their stairs. Near the bottom, she would always hug the wall. 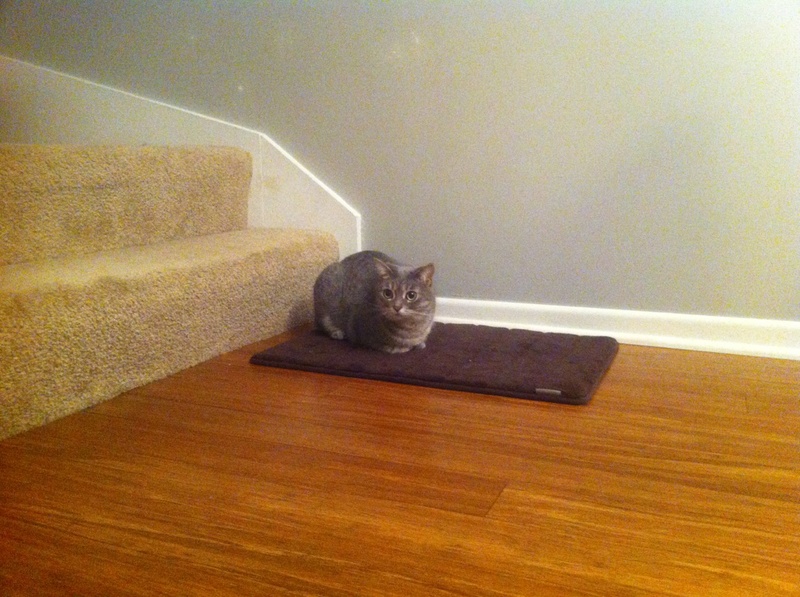 This made me think that we needed to keep any mat near the wall; if we centered it on the bottom of the stairs, it wouldn’t be in the right spot for her. Granted we could have gotten a wider one that’s the whole width of the stairs, but so far our smaller one has worked perfectly for her. Need: Something that she would actually use. Answer: Now this was a big question mark. I think we all could name one, two or twelve things we’ve done for our cats that they haven’t acknowledged or figured out. But, we wanted to give her the option anyway. Thankfully, we didn’t have to wait long. Right after we laid it down, she started using it. She even sits on it some days. I think she totally understood its purpose, and I really believe she’s grateful for it! I know this sounds like such a little thing, but it really is a simple solution that has helped immensely. Ellie still has a little trouble now and then, but her transition from carpet to hardwood is now a great deal less dangerous. And I think we both feel better about it. Have you discovered a simple solution in your home that has made a big difference in the life of your CH cat? Please share in the comments! ← Huffington Post: Sorry, But Your Cat is a Jerk. It’s Science. This is a great idea! I often find my CA cat Elvis trying to climb the stairs and takes the odd tumble. Luckily he never falls more than 2 stairs onto the hardwood landing and has never harmed himself. However, this is something that worries me so I will definitely be getting a padded mat. I have fixed a baby stair gate to the top of the first flight of stairs, but the 2nd flight doesn’t have suitable fixing posts for another stair gate. I have discovered that there are stair gates available for ‘awkward’ stair angles and constructions (e.g. BabyDan Flexi Fit Gate) which I may well look into. On a different subject, Elvis occasionally urinates in one of his beds, or on my chaise longue. He is perfectly capable of getting to the litter tray, and indeed frequently does, so I can’t work out if his occasional incontinence is a function of his condition, laziness, or rebelliousness! Until recently I was putting down layers of towels and blankets which I would have to wash most days. I have now discovered Lille Disposable Bed Pads, which make life a whole lot easier! Moo, one of my regular cats had a (thankfully short) phase of jumping on OUR bed and peeing, even while I was sat on it, I have no idea what she thought she was doing but stopped almost as soon as she started. Another peed in her bed but that was because she had a stroke and was marking it to say this was hers and to also help her find her way back to it, perhaps check his vision, Im sure Punky was blind for many weeks before we finally clued in that she could see nothing.